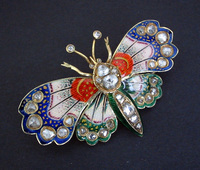 A nice and important 1850-1860 Victorian era antique guilloche enameled diamond brooch in the form of a flying butterfly. Most likely of English origin although it comes with a perfect antique Swiss fitted box from same era. 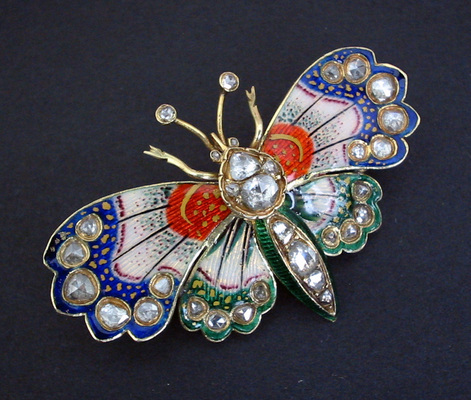 This rare antique insect brooch has superb multicolor guilloche enamel wings and paved with a total of 32 rose cut diamonds having an estimated total diamond weight of about 1.5 carats. The brooch tests a striking 20+ karat yellow gold along wings and base and pin is 18 karat gold. It has a gross weight of 14.8 grams and measures 50mm across wings and 32mm tall. Absolutely scarce antique jewelry / jewellery collector piece and one of the exceptional Victorian era diamond set guilloche enamel butterfly and insect brooches and jewels.